Last five ONI Index are DJF 2018 -0.9ºC, JFM 2018 -0.8ºC, FMA 2018 -0.6ºC, MAM 2018 -0.4ºC and AMJ 2018 -0.1ºC. Latest Nino 3.4 SST is 0.11ºC and the calculated ONI AMJ 2018 -0.1ºC is negative but in neutral zone. 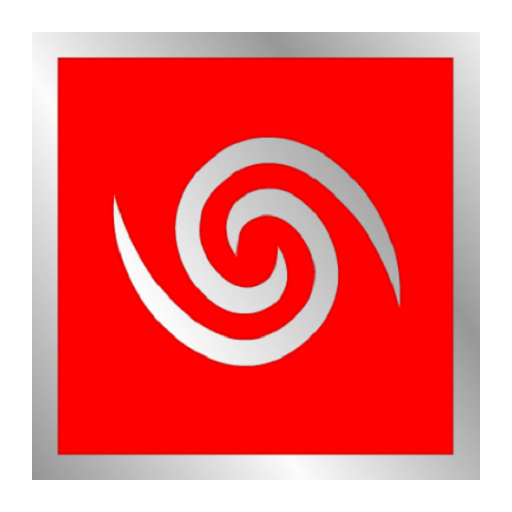 Hence ENSO neutral conditions continues to exist. 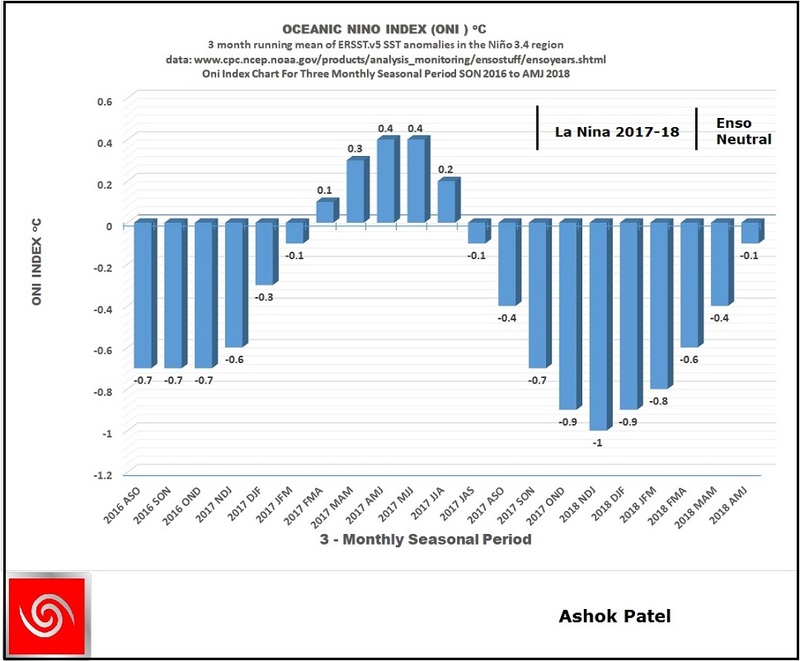 La Nina event 2017-18 had officially ended at the end of April 2018 (FMA 2018). ENSO neutral conditions exists since then. The last La Nina event was the second consecutive La Nina event, the first one was 2016-17 La Nina event that ended at the end of January 2017 (NDJ 2017). 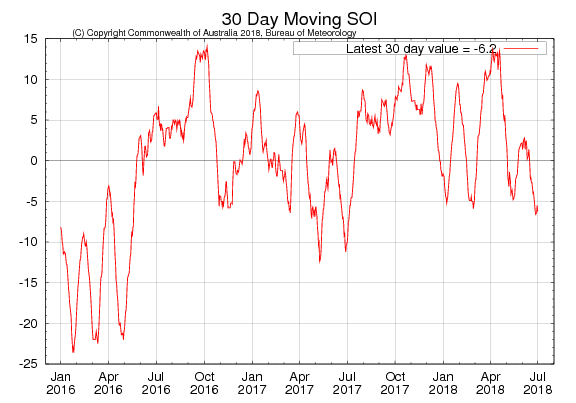 The 30-day Southern Oscillation Index (SOI) to 1 July was −6.2, and the 90-day SOI was −0.8. The SOI has been within the neutral range since late April. 30 Days average SOI was -7.63 at the end of June 2018 and was -6.27 on 6th July 2018 as per The Long Paddock – Queensland Government and 90 Days average SOI was -2.24. SOI Monthly graph up to June 2018 as per The Long Paddock – Queensland Government. Equatorial sea surface temperatures (SSTs) are near-to-above average across he east-central Pacific Ocean. ENSO-neutral is favored through Northern Hemisphere summer 2018, with the chance for El Niño increasing to 50% during fall, and ~65% during winter 2018-19. All but one of the eight surveyed international climate models predict further warming of central equatorial Pacific sea surface temperatures (SSTs) over the coming months. During the remainder of the southern hemisphere winter, all models forecast central Pacific SSTs to remain within neutral values. 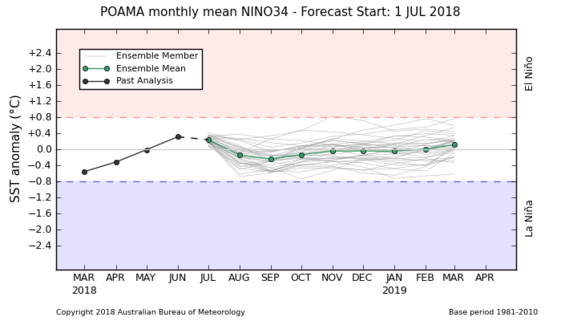 However, five of the eight models reach El Niño levels during spring, with a sixth model falling just short of the threshold value. Last five ONI Index are DJF 2018 -0.9ºC, JFM 2018 -0.8ºC and FMA 2018 -0.6ºC, MAM 2018 -0.4ºC, AMJ 2018 -0.1ºC. The last two 3-monthly seasonal ONI Index indicates Enso Neutral conditions continue to prevail from May 2018. June 2018 SST anomaly for Nino 3.4 for is 0.11ºC. Using NOAA criteria, a full-fledged El Nino event is rules out during the Indian Summer Monsoon, since there are only three 3-monthly seasons left till end of September 2018, namely MJJ 2018, JJA 2018 & JAS 2018, and Indian Summer Monsoon normally comes to an end by then (September end). El Nino requires El Nino thresh hold to continue for five consecutive 3-month;y seasons. NOAA માપદંડ મુજબ 2018 જુન આખર ના ENSO ન્યુટ્રલ સ્થિતિ ચાલુ રહી. છેલ્લા પાંચ ત્રી-માસિક સીઝન નું ONI ઈન્ડેક્સ આ પ્રમાણે છે: DJF 2018 -0.9ºC, JFM 2018 -0.8ºC and FMA 2018 -0.6ºC, MAM 2018 -0.4ºC, AMJ 2018 -0.1ºC. છેલ્લું ત્રી-માસિક સીઝન AMJ 2018 નું ONI ઈન્ડેક્સ -0.1°C, એટલે NOAA માપદંડ મુજબ મે 2018 ની જેમ Enso ન્યુટ્રલ ઝોન માં છે. જુન 2018 નું નિનો 3.4 નું SST ઍનોમલી 0.11ºC છે. અત્યાર સુધી એક પણ મહિના નું નિનો 3.4 નું SST ઍનોમલી કે છેલ્લું ONI ઈન્ડેક્સ એલ નિનો ના ઉંબરા સુધી પહોંચેલ નથી. માટે ભારતીય ચોમાસા દરમિયાન NOAA ના માપદંડ મુજબ વિધિવત ‘એલ નિનો’ થવાની શક્યતા નથી. કારણ એમ છે કે ભારત નું ચોમાસુ સપ્ટેમ્બર આખરે પૂરું થતું હોય છે અને હવે સપ્ટેમ્બર આખર સુધી ફક્ત ત્રણ ત્રી-માસિક સીઝન બાકી છે, જે છે MJJ 2018, JJA 2018 & JAS 2018 અને એલ નિનો માટે ઓછા માં ઓછી પાંચ ત્રી-માસિક સીઝન જોઈએ.